The turkey is first brined in a sweet and tangy mixture of brown sugar, Dijon mustard and cayenne pepper, then deep-fried to mouthwatering deliciousness. Combine brown sugar, mustard, salt and cayenne pepper in large non-metallic container. Gradually whisk in the water, thyme and garlic. Place turkey in brine mixture. Cover and refrigerate overnight. Preheat oil to 400°F (205°C). Pat turkey dry with paper towels. Place turkey, breast side up, in basket. Slowly lower basket into hot oil, being cautious of splattering oil. Maintain oil temperature at about 3350°F (175°C). 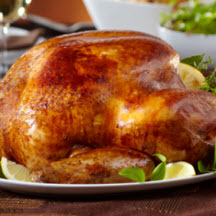 Fry turkey for 3 1/2 to 4 minutes per pound. Remove from oil to check doneness. Insert an instant-read thermometer into thickest part of the breast, not touching bone. Temperature should read 170°F (76.6°C). Insert thermometer into thickest part of the thigh, not touching bone. Temperature should be 180°F (82.2°C). Remove turkey from hot oil and drain on paper towels. Let rest for 15 minutes before carving. Remember you are dealing with gallons of dangerously hot oil, so make sure there are no kids or pets running around. And you want to wear some old shoes that you can slip out of easily and long pants just in case you do spill some oil on you. Place fryer on level dirt or grassy area. Never fry a turkey indoors, in a garage or in any other structure attached to a building. Avoid frying on wood decks, which could catch fire, and concrete, which can be stained by the oil. Never leave the hot oil unattended and don't allow children or pets near the cooking area. Allow the oil to cool completely before disposing or storing. Immediately wash hands, utensils, equipment and surfaces that have come in contact with raw turkey. Turkey should be consumed immediately and leftovers stored in the refrigerator within two hours of cooking. Use only oils with high smoke points, such as peanut, canola or safflower oil. To determine the correct amount of oil, place the turkey in the pot before adding seasoning and add water until turkey is covered. Take turkey out of the water before marking the oil level. Measure the amount of water and use a corresponding amount of oil. Dry the pot thoroughly of all water. Large containers of peanut oil are available at membership warehouse stores, supermarkets, discount department stores. Turkey cookers with pots and propane burners can be bought at large supermarkets, sporting goods stores, restaurant suppliers, building-supply stores, and hardware stores. Injectors are available at specialty cookware stores, department stores, and some of the outlets mentioned above. If you don't have a cooker and stockpot and don't want to buy them, they can be rented at party supply stores. The injector is easier to fill if you remove the needle. The oil may be strained to remove food particles and reused. It may also be disposed of with regular garbage. Recipe and photograph courtesy of Butterball, LLC.